Even here in the Pacific Northwest on days on warm spring days, it feels and looks like July. How do we get the main stream media to report these important truths? — and how to wake up the citizenry? I see a few glimmers — Chris Hayes is now providing excellent coverage of climate change (even if he is borrowing heavily without attribution from some of my previous work: https://robertscribbler.wordpress.com/2013/03/22/when-burning-is-no-longer-moral-a-call-for-fossil-fuel-abolition/). And the Showtime ‘Years of Living Dangerously’ is spot on. A few glimmers. But the MSM is still almost entirely asleep. You guys will probably have some rather interesting weather this year. You’re directly under a developing ridge and potential heat dome as well. In any case, I must say that I really appreciate your front line observations. Please send them in whenever you feel you’ve seen something out of the ordinary. The ‘interesting’ weather will commence here i Portland on Wednesday and Thursday with highs in the upper 80″s. Ps As I write the whole western sky is half dome of gauzy Mylar haze that is likely from the fires and dust storms in Siberia and China — plus whatever is added the atmosphere in the Northwest. Will post photos to my blog ASAP. And here on the other side of the dipole in Michigan it’s still very cool to cold on most days. Very good, thank you. The atmos.washington and the earth.nullschool links go together. Schools were closed and visibility was reduced to just 20 metres in places as the strongest sandstorm to strike the northern Chinese city of Dunhuang swept in. The sandstorm hit the city, in Gansu province, at 1.40pm on Wednesday, bringing strong winds and a sudden drop in temperature, and continued to rage for hours, forcing many people to wear masks. Coincident with ongoing heat waves. We have this in April. Should the pattern remain we are in for a very brutal summer. 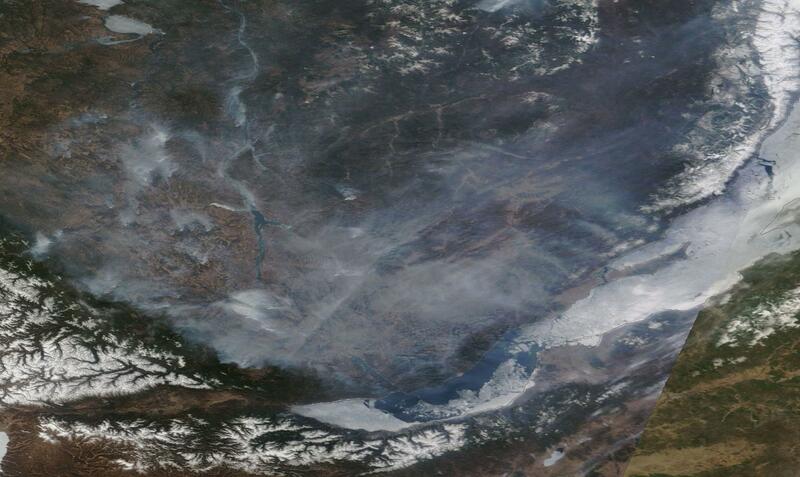 MODIS shots of fires are now even more impressive than yesterday. The once in the previous hot shot analysis from yesterday appear to have combined into a 100 mile long fire front. What is the prognosis for the Amazon should this El Nino develop fully? Would be some kind of double punch if the Amazon basin went into drought and the already bad fire situation there went out of control. Once rain forest is taken down, relative humidity in the area goes down and, as local fire fighters point out, fires that used to go out on their own now continue to burn on, compounding a sort of local feedback loop. Not sure what the local effects are of burned tiga and boreal forest are. I do know that in burned areas of our Northern Minnesota wilderness, the areas have a lot of ground heating in summer, as compared to the still forested areas. Sort of little heat islands, you can feel the dry heat as you canoe through a burned area. As compared to the humid warmth of the deep forest. The Amazon hasn’t spooled out quite as much as Siberia. That said, a bad El Niño year could kick it into rapid terminal decline. Working on a detailed assessment. Right now this is a moderate risk scenario. The Lake Baikal shroud is stunning! 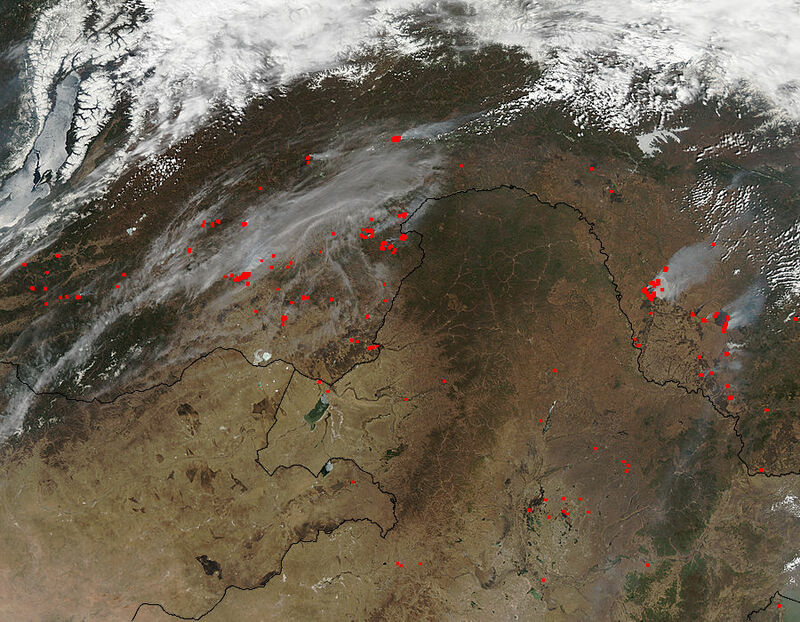 I’ve covered Russia’s worst fire seasons on record. Never seen anything like this so early. Heat dome already forming over NE China. I looked it up and I think it’s a river. In maps.google enter 50.408928, 130.517630 and switch to earth view. Thanks for the catch and good terrain analysis. Fixing this now. Fixed. Sorry for the delay. Was on travel today and just got off the road. 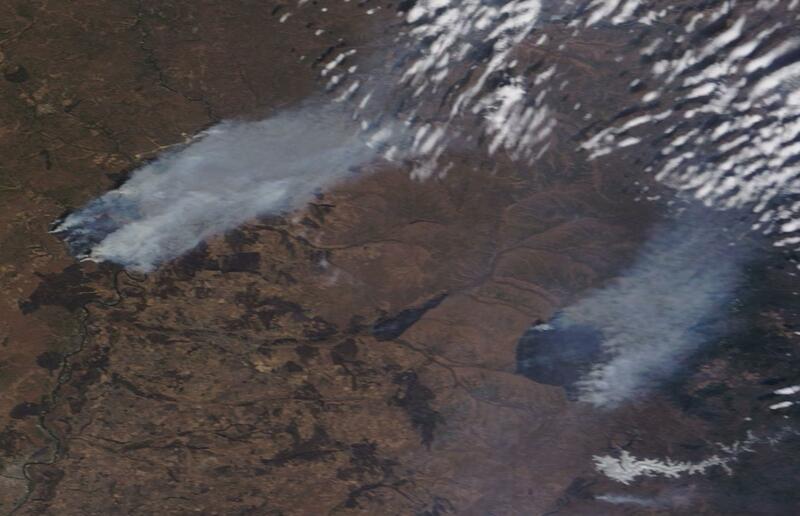 Southern Norway has also been battling with a bit of wildfires this April too. Its been unusually warm here for a long time now (as was the winter). Looking at Norway in the MODIS shot, it appears the snow is on the verge of going entirely. (Need to google translate that article). Alas, the article fails to mention why spring is arriving earlier. Any general analysis showing how this year compares to others in the past? Only able to find statistics covering 2000-2012 and there is no statistical indicator of a trend from that data. I looked at both forest fires and grass/bush fires. Will be interesting to see how 2013 and now 2014 will show up as they might be outlier events. I am sure Norway as a whole has improved its capacity to extinguish these also this past decade. We also have a gradual rise in annual precipitation also so that surely helps out too. You nailed it Bernard. Will complete a fact check when I get back to my desk tomorrow. Thanks for the terrain analysis assist. So, would it be better to have the tundra sit, wet and mucky, as it is converted into CH4? Or is it better to have the enemy that we can see — fire burning dry tundra to CO2? The fire makes a better graphic to convert those who are in denial , but he invisible terror of CH4 is a better point when asking climate modelers why they did include carbon feedback in the community climate models. Without carbon feedback the climate models are little more than vacation spas for electrons. It takes an estimate of triggers to carbon feedback to inform any kind of human carbon budget. It takes an estimate of the rate of carbon feedback to inform any kind of carbon budget. It takes an estimate of total carbon feedback effects to inform any kind of carbon budget. It takes a good estimate of sea rise as a result of ice dynamics to inform any kind of carbon budget. We are 4 estimates short of being ready to negotiate a global carbon budget. ps California has a lot of very dry forest. If El Nino brings one lighting strike to the region; Um, there will be some CO2 release. This is the other side of El Nino rains in California.